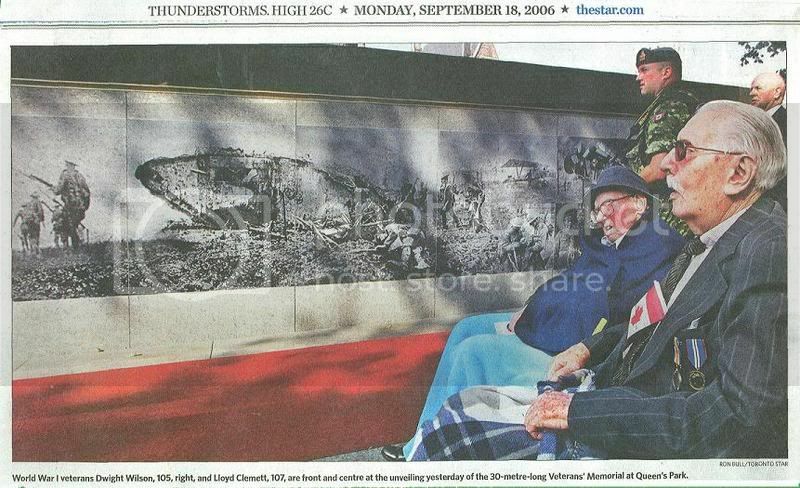 When Lloyd Clemett passed away on Wednesday February 21, 2007, he was the third last Canadian Veteran of the Great War. He is survived by Veteran Percy Dwight Wilson, who resides in Canada and John Babcock who resides in the United States. In the near future, we will begin posting information on the lives of Wilson and Babcock. 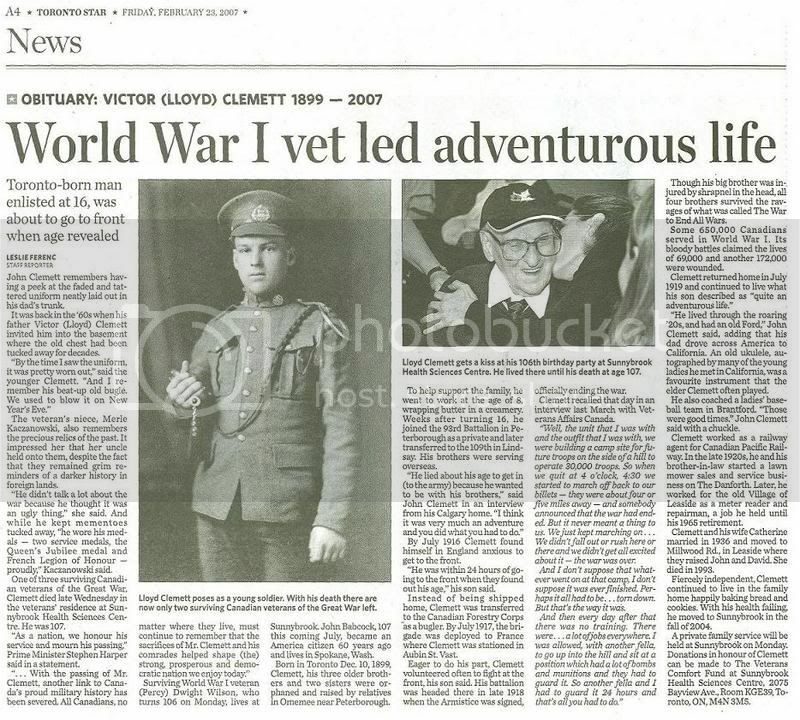 Volunteer members of the Canadian Expeditionary Force Study Group, which includes researchers from around the world, teamed together to gather what information was available on the history of Lloyd Clemett. We have done so to honour his contribution to the CEF and to make this information readily available to others. Private Clemett was born Victor Lloyd Clemett on December 10, 1899 to James Clemett and Agnes Howell. As reported in the 1911 Canadian Census, he is living with extended family. Unfortunately Lloyd can not be found in the 1901 Canadian Census because page 9 of the census schedule in the area they were living at in Toronto is missing from the records. The family lived at 65 Dagmar Avenue in Toronto. Agnes died in 1905 at age 36 of peritonitis. James was a stone cutter who died in 1907 of gas poisoning at age 56 (Source: Ontario Vital Records at Ancestry.ca). From his Attestion Papers at Library and Archives Canada, we note he was born on 1 October 1898 and was 18 years of age when he enlisted in the 57th Regiment in Peterborough, Ontario on January 31 in 1916. He was only 5'2" tall. His "Next of Kin" lists his brother Albert with the 21st Battalion. He was transferred from the 93rd Battalion to the 109th Battalion. As you will notice from his Attestation Papers, Lloyd lied about his age so he could join the CEF. For further information on the soldiers and units of the Canadian Expeditionary Force in the Great War, please visit us at the Canadian Expeditionary Force Study Group or contact us at the Matrix Project. For an index of CEF WW1 Soldiers in the Blogger Program, please check the CEF Soldier Blobber Index.